P. D. Jones and P. A. Reid. 2001. A Databank of Antarctic Surface Temperature and Pressure Data. ORNL/CDIAC-27, NDP-032. Carbon Dioxide Information Analysis Center, Oak Ridge National Laboratory, U.S. Department of Energy, Oak Ridge, Tennessee. doi: 10.3334/CDIAC/cli.ndp032. This database contains monthly mean surface temperature and mean sea level pressure data from twenty-nine meteorological stations within the Antarctic region. The first version of this database was compiled at the Climatic Research Unit (CRU) of University of East Anglia, Norwich, United Kingdom. The database extended through 1988 and was made available in 1989 by the Carbon Dioxide Information Analysis Center (CDIAC) as a Numeric Data Package (NDP), NDP-032. This update of the database includes data through early 1999 for most stations (through 2000 for a few), and also includes all available mean monthly maximum and minimum temperature data. For many stations this means that over 40 years of data are now available, enough for many of the trends associated with recent warming to be more thoroughly examined. Much of the original version of this dataset was obtained from the World Weather Records (WWR) volumes (1951-1970), Monthly Climatic Data for the World (since 1961), and several other sources. Updating the station surface data involved requesting data from countries who have weather stations on Antarctica. Of particular importance within this study are the additional data obtained from Australia, Britain and New Zealand. Recording Antarctic station data is particularly prone to errors. This is mostly due to climatic extremes, the nature of Antarctic science, and the variability of meteorological staff at Antarctic stations (high turnover and sometimes untrained meteorological staff). For this compilation, as many sources as possible were contacted in order to obtain as close to official `source' data as possible. Some error checking has been undertaken and hopefully the final result is as close to a definitive database as possible. This NDP consists of this html documentation file, an ASCII text version of this file, six temperature files (three original CRU files for monthly maximum, monthly minimum, and monthly mean temperature and three equivalent files slightly reformatted at CDIAC), two monthly mean pressure data files (one original CRU file and one slightly reformatted CDIAC version of the file), four graphics files that describe the station network and the nature of temperature and pressure trends, a file summarizing annual and mean-monthly trends in surface temperatures over Antarctica, a file summarizing monthly Antarctic surface temperature anomalies with respect to the period 1961-90, a station inventory file, and 3 FORTRAN and 3 SAS routines for reading the data that may be incorporated into analysis programs that users may devise. These 23 files have a total size of approximately 2 megabytes and are available via the Internet through CDIAC's Web site or anonymous FTP (File Transfer Protocol) server, and, upon request, various magnetic media. Due to the prospects of a warmer climate under enhanced greenhouse conditions there has been much study undertaken to understand the role which Antarctica may play under different climatic conditions. Of late, much of this work has been undertaken by examining computer model simulations using General Circulation Models. These methods provide the ability to forecast changes in climatic conditions in this region. In an effort to validate model results there is a need to provide accurate in situ data. Within this study we have assembled a database of surface temperature and mean sea level pressure data from meteorological stations within the Antarctic region. It draws heavily on the study by Jones and Limbert (1987) (hereafter JL87), and differs from that study in including data up until the early part of 1999, almost 12 extra years of monthly mean temperature and pressure data. Also included here are all the available mean monthly maximum and minimum temperature series. For many stations this means that over 40 years of data are now available, enough for many of the trends associated with recent warming to be more thoroughly examined. Temperature and pressure data for 29 stations over Antarctica were collected. Much of the database comes from the JL87 dataset. In turn, this dataset came from the World Weather Records (WWR) volumes (1951-1970) and Monthly Climatic Data for the World (since 1961), and several other sources. Updating the station surface data involved requesting data from countries who have weather stations on Antarctica. Of particular importance within this study are the additional data obtained from Australia, Britain and New Zealand. Large amounts of data were obtained from the web site of Jo Jacka, hosted by the Antarctic Cooperative Research Centre (Jacka and Budd 1998). 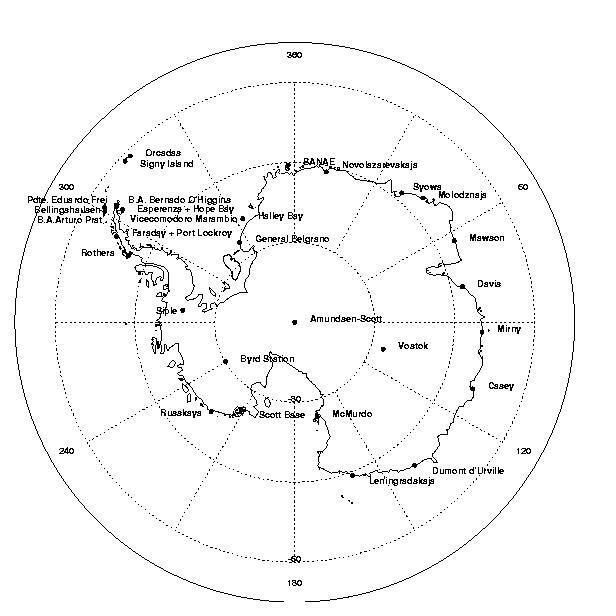 Data for the British bases were obtained from the British Antarctic Survey (BAS) web site, British Antarctic Survey (BAS), contact: Steve Harangozo. Data on this site also included those from Bellingshausen (Russia), Orcadas (Argentina), and the UK stations Faraday (now Ukraine and renamed Vernadsky), Halley, Rothera, and Signy (Harangozo and Colwell 1995). New Zealand data were obtained through Jim Salinger at the National Institute of Water and Atmospheric Research Ltd. (NIWA), Wellington, New Zealand. Despite several sources of Antarctic station data there are frequent missing data and errors. For example, station temperature can be mistakenly recorded in Fahrenheit, rather than Celsius, and transposing data from written media to digital can lead to further errors. In most cases, pressure is expressed here as mean sea level (mslp); however, due to the variability in calculating mslp over the plateau region, pressure data for four high-elevation stations are expressed as surface pressure. These stations are Amundson-Scott (No. 89009), Vostok (No. 89606), Byrd (No. 89125), and Siple (No. 89083). Data availability closely followed JL87. Stations providing data are shown in Fig. 1. An important part of the data packaging process at CDIAC involves the quality assurance (QA) of data before distribution. Data received by CDIAC are rarely in a condition that would permit immediate distribution, regardless of their source. To guarantee data of the highest possible quality, CDIAC performs extensive QA checks, examining the data for completeness, reasonableness, and accuracy. In the case of these Antarctic data, very little was found which needed correcting or checking with the CRU data contributors. Some reformatting of files was performed, which will be detailed below under "CDIAC Quality Assurance Checks and Data Reformatting", but first, detailed descriptions of those checks applied at the CRU will be summarized. In some cases there were four sources of data, but more often two or three. For each station, the sources were cross checked against each other. Where data sets overlapped, these were automatically checked for consistency, which gave an initial indication of where problem data may exist. Some large discrepancies became apparent--some from obvious typos--while others (often smaller but more numerous) were not immediately obvious. This involved checking the errors (discrepancies) found in (1) above. Yearly cross sections of the data (Jan through Dec) along with cross sections of nearest neighbors were plotted one over the other. In some cases, due to spatial resolution, there is very little consistency between near neighbors. Often this procedure was able to discern where gross errors existed but sometimes only gave a indication of support for one source of data over another. However, after this process, most major discrepancies, and a few other obvious errors, were either resolved or support was given for one particular value over another. A check using the formula (max+min)/2=mean temperature was also made. Errors outside 2C were flagged and checked (over 170 such values were found over the entire database!). Also, errors of the kind where max < min and where the monthly mean figure was outside of the max to min window (i.e., where min > mean or max < mean) were checked. This check enabled many of the initial overlap errors (as described in (2) above) to be resolved. In several cases where the error in the mean value was not supported by another source, but a discrepancy existed between the (max+min)/2, the mean was replaced with the value of (max+min)/2. Here data were converted to monthly anomalies from long-term monthly means. Each of these anomalies was plotted and compared to the anomalies from near neighbors (as a second near neighbor check). Few errors were found and where possible these were replaced with station data for that month from another source. After this stage all of the inconsistencies between datasets were resolved. Some datasets were originally transposed from hard copy. Where necessary these have been checked against the final dataset. The Antarctic temperature and pressure data arrived in very fine shape from the CRU; probably as clean as any database CDIAC has ever received, quality assured, documented, and archived. After conducting basic checks pertaining to things such as consistent formatting of the files, properly sorted records, consistent units, and clear missing data indicators, only one actual correction took place: one station identification record in a data file happened to have a different record length than the others, and was edited. Given the cleanness of the database, CDIAC only chose to concentrate further on offering the data files in an additional format that may be easier for some users to work with: files with a station identification field in every record of the database (the typical CDIAC method), rather than data files with identification and data records interleaved in the same file (the format received from the CRU). Both types of files are offered with this database and are described in detail in the "File Descriptions" section of this documentation. A number of studies of Antarctic station data have been undertaken previously (e.g., Jones and Wigley 1988; Jones 1990; Jones 1995; Jacka and Budd 1998; King and Harangozo 1998; and Skvarga et al. 1998). Two additional analyses are briefly undertaken here. First, the data contributors update the continent-wide temperature averages produced by Raper et al. (1984) and Jones (1995). Figure 2 shows the annual Antarctic average temperature series for the 1957-1999 period. Stations contribute to this average if they have sufficient (20 years) data during the 1961-1990 base period. The annual series shows a warming over the past 40 years but most of this warming occurred before 1970. Table 1 lists the warming trends and their significance based on the t-test for each month of the year. Table 2 lists the anomaly series for 1957-1999. An increase in the annual surface temperatures is shown over this period (1.53C per century), with the largest trend apparent in the winter months, as found for northern hemisphere polar regions (Weller, 1998). This can be compared with the Jacka and Budd (1998) finding of a continent-wide warming of 1.2C per century. The greater variability in the winter season is indicative of a lower significance of the change than in the other seasons. A decrease in Antarctic surface temperatures is found for some months (April and May). 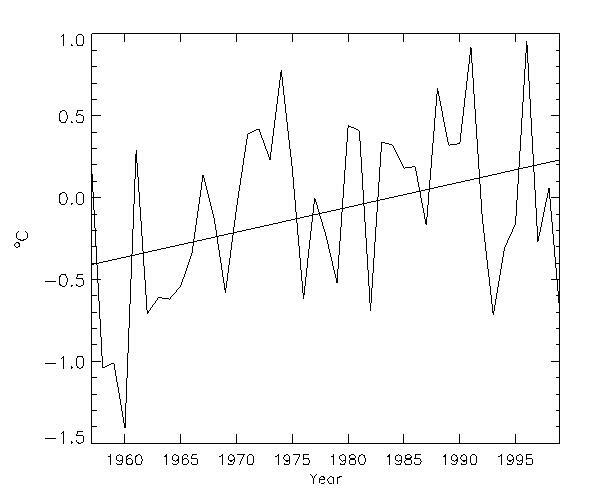 Surface temperature trends are seen to rise quite steadily up until 1991. In that year Mount Pinatubo (Philippines) and Mount Hudson (Chile) erupted, and it has been suggested (Jacka & Budd, 1998) that these eruptions have had a major influence on the general lowering of temperatures after that year. Each of these stations have long-term records of 30 years or longer. All Category A stations show a marked temperature decrease during May and a general temperature increase during June through September, although some show a local minimum during August, and October. 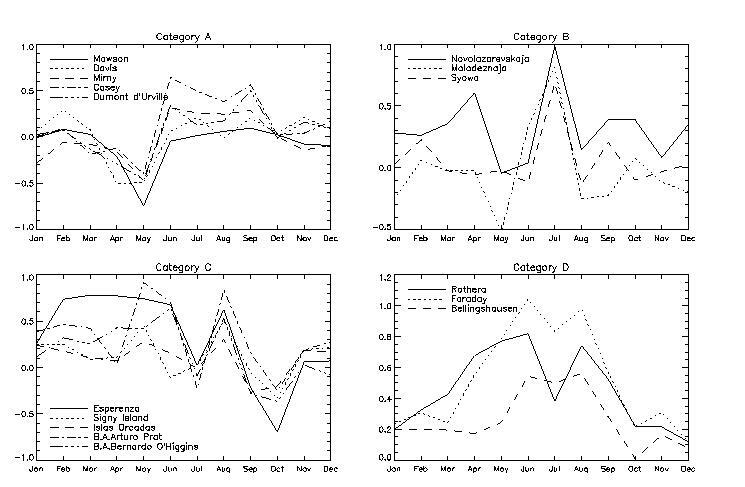 Category B stations show above average temperature increases during July, while Category C shows a decrease (or distinct local minimum) during July. For Category B stations there is a local minimum in surface temperature trends during May. Category C shows a decrease in temperatures during October, and a local minimum in July. 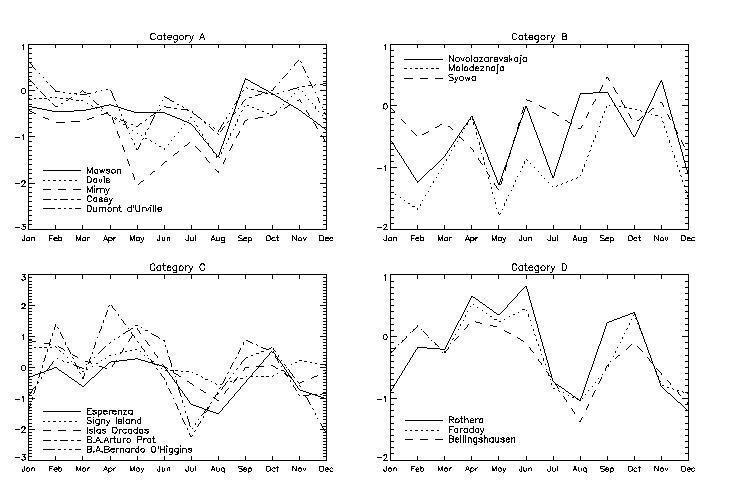 Category D shows temperature increases throughout the year, although the seasonal distribution is inversely proportional to monthly mean temperatures for those stations. This category also shows a local minimum during July. Clearly, while temperature trends suggest a continent-wide warming, we find variations in temperature trends on a monthly and spatial basis. Van den Broeke (1998) found that a weakening of the Southern Hemisphere semiannual oscillation has occurred since the mid 1970s--associated with a decrease of meridional air exchange--that has caused significant May/June cooling in coastal East-Antarctica. This is reflected to some degree in the long-term cooling during May in Category A stations (Fig. 3). All Category A stations show a greater surface pressure decrease during May and August. For Category B stations there is a local minimum in surface pressure decrease during May. Category C stations show above average surface pressure decreases during July-August and a local minimum during March. Category D shows a clear local minimum in surface pressure decreases during August. While these observations suggest there may be some link between regional temperature trends and decreases in station surface pressures, it is rather too simplistic to present as a clear argument. Some localized changes in surface temperature do coincide with changes in surface pressure and vice versa. In short, variability of trends in surface temperature, spatially and throughout the year, cannot be simplistically attributed to circulation changes, but more likely result from a mix of dynamic and physical factors involving complex feedback effects. Localized sea ice extent and concentration have been shown to be closely linked with surface temperatures. Simmonds & Budd (1991) found that increased leads in sea ice are shown to increase temperatures in those areas. Both King (1994) and Weatherly et al. (1991) found that the relationship between sea ice extent and surface temperatures are stronger around the west coast of the Antarctic Peninsula (Category D) than the rest of Antarctica. Sea ice anomalies (retreat) lag increases in temperature, although temperature increases persist, suggesting sea ice is to some degree controlled by temperature with some feedback effect. This section describes the 20 files contained in this database. In addition to 9 Antarctic data files, there are 11 files that include associated documentation and FORTRAN and SAS codes for reading the data files. This file is an ASCII version of the HTML documentation that may be found for NDP-032 on CDIAC's World Wide Web site. It exists for the benefit of those downloading the database directly from CDIAC's file transfer protocol (FTP) area without the use of a web browser. invent.for - a FORTRAN program for reading the station inventory file (station_invent.txt). origdata.for - a FORTRAN program for reading any of the four temperature/pressure data files originally provided by the CRU to CDIAC. These files have station identification records interleaved in the data records. refdata.for - a FORTRAN program for reading any of the four temperature/pressure data files reformatted by CDIAC to include only data records, with the station identification number being the first field of each record. invent.sas - a SAS® program for reading the station inventory file (station_invent.txt). origdata.sas - a SAS® program for reading any of the four temperature/pressure data files originally provided by the CRU to CDIAC. These files have station identification records interleaved in the data records. refdata.sas - a SAS® program for reading any of the four temperature/pressure data files reformatted by CDIAC to include only data records, with the station identification number being the first field of each record. NAME   is the name of the station. There are eight data files: four original data files provided by the CRU with station identification records interleaved with the data records, and four analogous files slightly reformatted by CDIAC so that they contain only data records, with the station identification number in the first column of each record. The four files of each type contain monthly mean maximum temperature, monthly mean minimum temperature, monthly mean temperature, and monthly mean sea level pressure (mslp; 25 stations) or station surface pressure (4 stations; detailed in Sect. 2). The file descriptions below discuss measurement units. stations, but most stations have far shorter records. mean sea level pressures, depending on the data file. (times 10), e.g., a pressure of 9876 would indicate 987.6hPa. also indicated by the value -999. Harangozo, S. A. and S. R. Colwell. 1995. B.A.S. meteorological database users guide. B.A.S. Meteorology Section, Ice and Climate Division. Jacka, T. H. and W. F. Budd. 1998. Detection of temperature and sea ice extent changes in the antarctic and southern ocean. Ann. Glaciol. 27:553-559. Jones, P. D. 1990. Antarctic temperatures over the present century - A study of the early expedition records. J. Clim. 3(11):1193-1203. Jones, P. D. 1995. Recent variations in mean temperature and the diurnal temperature range in the Antarctic. Geophy. Res. Lett. 22(11):1345-1332. Jones, P. D. and D. W. S. Limbert. 1987. A databank of Antarctic surface temperature and pressure data. U.S. Dept. of Energy Technical Report, TR038, U.S. Dept. of Energy, Washington D.C.
Jones, P. D. and T. M. L. Wigley. 1988. Antarctic gridded sea level pressure data: An analysis and reconstruction back to 1957. J. Clim. 1(12):1199-1220. King, J. C. 1994. 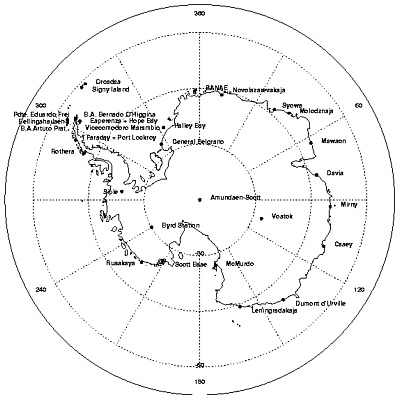 Recent climate variability in the vicinity of the Antarctic Peninsula. Int. J. Clim. 14:14357-14369. King, J. C. and S. A. Harangozo. 1998. Climate change in the western Antarctic Peninsula since 1945: observations and possible causes. Ann. Glaciol. 27:571-575. Raper, S. C. B., T. M. L. Wigley, P. R. Mayes, P. D. Jones and M. J. Salinger. 1984. Variations in surface air temperatures, part 3: The Antarctic 1957-1982. Mon. Weather Rev. 112:1341-1353. Simmonds, I. and W. F. Budd. 1991. Sensitivity of the Southern Hemisphere circulation to leads in the Antarctic pack ice. Q. J. R. Meteorol. Soc. 117:1003-1024. Skvarga, P., W. Rack, H. Rott, and T. I. Donangelo. 1998. Evidence of recent climatic warming on the eastern Antarctic Peninsula. Ann. Glaciol. 27:628-632. Van den Broeke, M. R. 1998. The semi annual oscillation and Antarctic climate, part 1: Influence on near-surface temperatures (1957-1979). Antarctic Science 10(2):175-183. Weatherly, J. W., J. E. Walsh, and H. J. Zwally. 1991. Antarctic sea ice variations and seasonal air temperature relationships. J. Geophys. Res. 96:15119-15130. Weller, G. 1998. Regional impacts of climate change in the Arctic and Antarctic. Ann. Glaciol. 27:543-552.